Once again it was Dr Ali’s enthusiasm that got this show on the road. 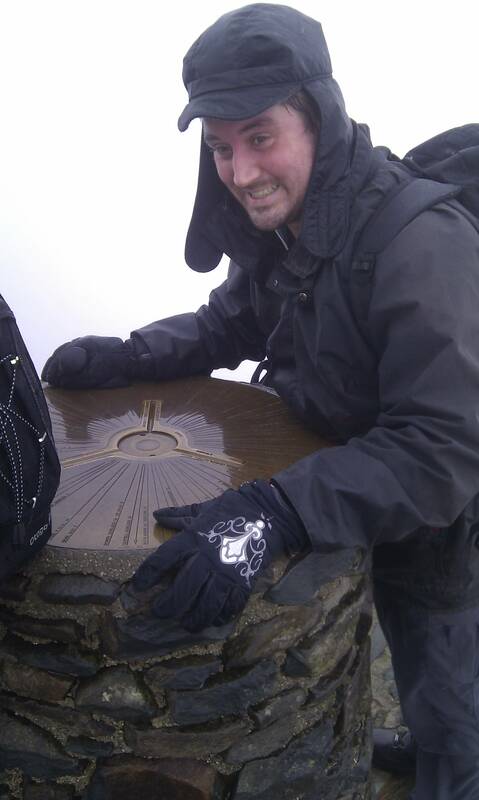 Whilst out on a local run last week I mentioned that my plan to run up Snowdon may not materialise this year. Dr Ali had a window and suggested that we should try to get over there this weekend. Which we did. We decided on a ‘commando’ style attack – travelling up on Friday night in Dr Ali’s camper van, pitching up at the Nant Peris camp site, starting the run early Saturday and getting back home at lunch time. We arrived at the camp site in time to take in refreshments (well, we would wouldn’t we?) 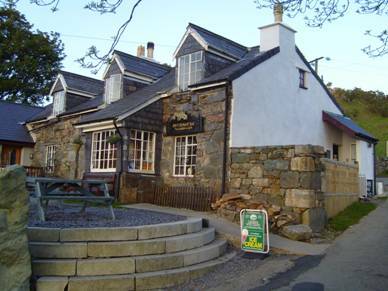 at the Vaynol Arms – one of those climbers’ pubs with great location, atmosphere, beer and food. After a hearty breakfast we set off for Llanberis where we donned our running gear and set off on the run. After a week of torrential rain we had been blessed with almost perfect conditions – dry, with broken cloud; plenty of sunshine but cold. The only warning sign of things to come higher up was the occasional ferocious gust of wind. Without thinking about it too much, I had kind of subconsciously split the run up into sections of difficulty. The first section is the steep ascent up the road leading to Penceunant – a familiar place to anyone who’s done Snowdon in the Snow. We set off at the same time as half a dozen mountain bikers. As we approached this section I mentioned to Dr Ali that we would probably catch them up and overtake them, and wondered how many times during the endeavour we would get in each other’s way. By the time we’d got to Penceunant we’d passed them all. It wasn’t long before we were off the lane, through the gate and on to the mountain proper. Just one more section of climb before the path evened out to a long, flat stretch. Funny thing is, the long flat stretch doesn’t exist. It seems to when you walk the route. But when you’re running it your legs constantly remind you that you are, in fact, on a constant uphill slog. We reached the ‘half way house’ in under 40 minutes. A further 7 minutes saw us at the bottom of my next difficult section – the steep slog up to the bridge after Clogwyn Station where the path cuts 90 degrees right under the bridge. It was here that I think I began to ‘concentrate’ on regulating every single step and breath in order to complete the section and have enough left to complete the next. With the end of the ‘Cloggy slog’ in sight, the incline became less steep. This led to a natural urge to pick up the pace a bit. I realised instantly that my legs disagreed. I didn’t argue, and carried on to the bridge at the same pace. 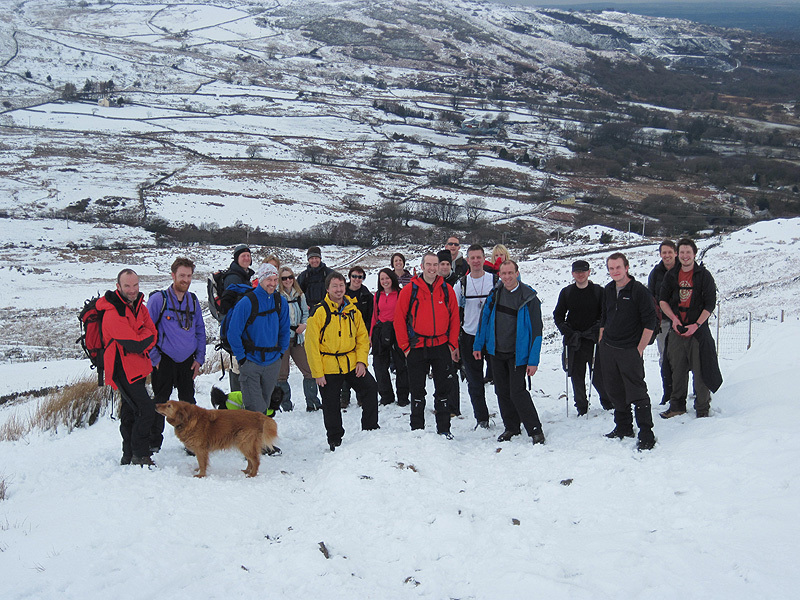 After a brief stop and a photograph we agreed that we were on track to get to the summit in less than 40 minutes. We set off. In my mind we had a couple of hundred metres until the path got steep again. In reality we had about 10. I locked into a rhythm and plodded up. The bright sunshine suddenly changed to thick fog. The odd fierce gusts of wind turned into a perpetual ferocious wind. The temperature plummeted. I began to freeze. Not wanting to disturb my rhythm, I spent the next 5 minutes manipulating my hat and coat out of my rucksack and getting them onto my head and body on the move. The next thing I knew, we were at the monolith at Blwch Glas and continuing on up the summit ridge in icy conditions. We skipped up the steps to the summit cairn and took photos. I was elated. We had made it to the top in 1 hour and 19 minutes. I tried to think back and realised that I had been in a type of trance since the bottom of the steep section before Cloggy, and that everything before and since had become a dream-like blur. I didn’t seem to have had a conscious thought during that time; some would say that’s not that unusual for me! 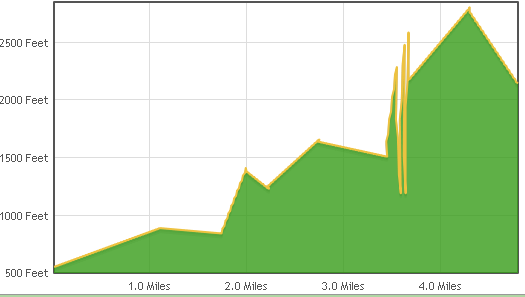 I’m not a down-hill runner but felt like I was skipping down the summit ridge. Bouncing from rock to rock as we dodged past people on their way up. 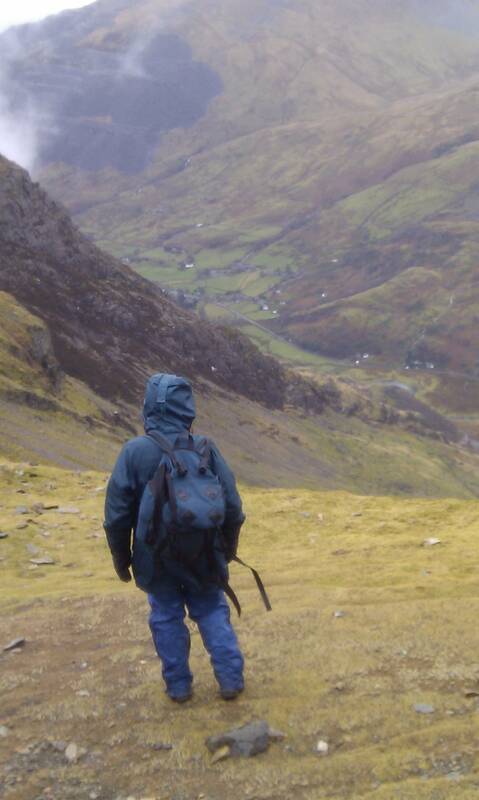 I even enjoyed running down the steep section back to Cloggy with my knees bouncing up to my chin. A quick time check showed that we had returned back to Cloggy from the summit in a surprising 11 minutes. At the bottom of the steep section leading up to Cloggy we met the mountain bikers we’d passed on the way up to Penceunant, still slogging their way up with their push irons. The rest continues to be a euphoric blur. I remember hopping and skipping my way back to the bottom without a care in the world, utterly enjoying every step of the way. I can only imagine that the exertion induced a kind of Zen like meditative experience. Whatever, I don’t think I have enjoyed myself or felt so carefree since I was a kid. I suggested to Dr Ali that we do the same every Saturday morning but in retrospect I’m not sure just how practical that would be. The weather forcast for tomorrow from http://mwis.org.uk And it couldn’t really be much better. 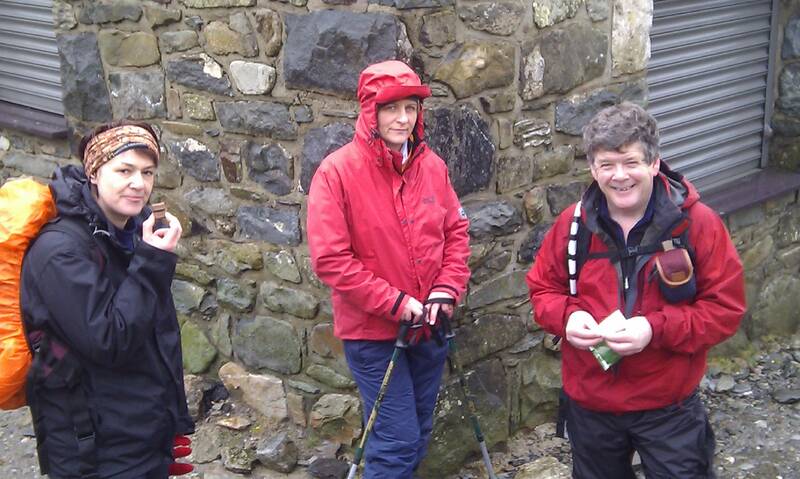 I spoke to Steffan at Pennceunant Isaf this morning who has extended his usual, fine hospitality (hot drinks, warming up our food, bara brith etc) to us for tomorrow’s walk. Pennceunant Isaf is a beautiful tea rooms and art gallery at the foot of the mountain path (Llanberis Path) on Yr Wyddfa (Mount Snowdon). Every year Steffan allows us to park a few cars up there. 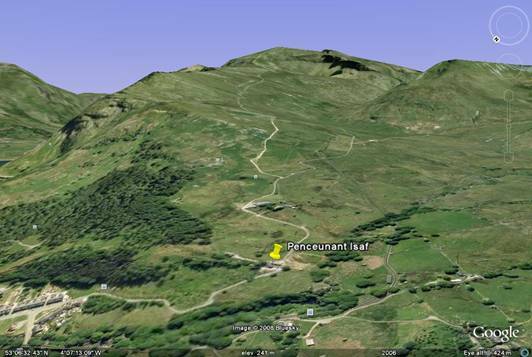 This means that the people who would prefer not to do the walk up the steep road which leads up to Pennceunant Isaf can start the walk from there instead – though I am trying to discourage it this year as the group is so big. Steffan also provided me with a report on the conditions and the weather. SNOW! lots of it. Eveywhere. It’s even snowing now and he has warned me that we may not be able to get cars up the road anyway. On the picture below you can clearly see the route we will be taking. Where the path disapears at the top of the mountain is not the destination. 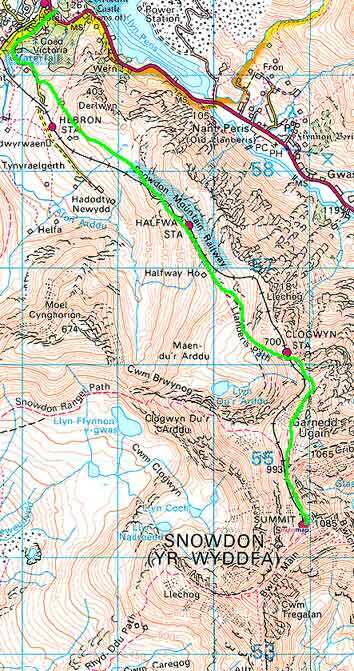 At that point (Clogwyn Station) we turn sharp right and traverse the west face of Garnedd Ugain (centre of the picture). The sharp turn at Clogwyn Station is a danger spot in bad visibility as failing to turn here will take you over the cliffs of Cwm Hetiau – Valley of the Hats (So called because the wind at this point would blow the hats off the heads of the Victorian ladies and gentlemen riding the train, into the valley below where they wold be found and used by the locals) . If visibility is bad I would urge anybody who is not familiar with the route not to proceede past this point without help. From there it’s just a quick hop, skip and a jump to the summit 🙂 See you there!